Nepalese artist H11235 is painting Eugene’s streets as part of a sister city program with Khatmandu. 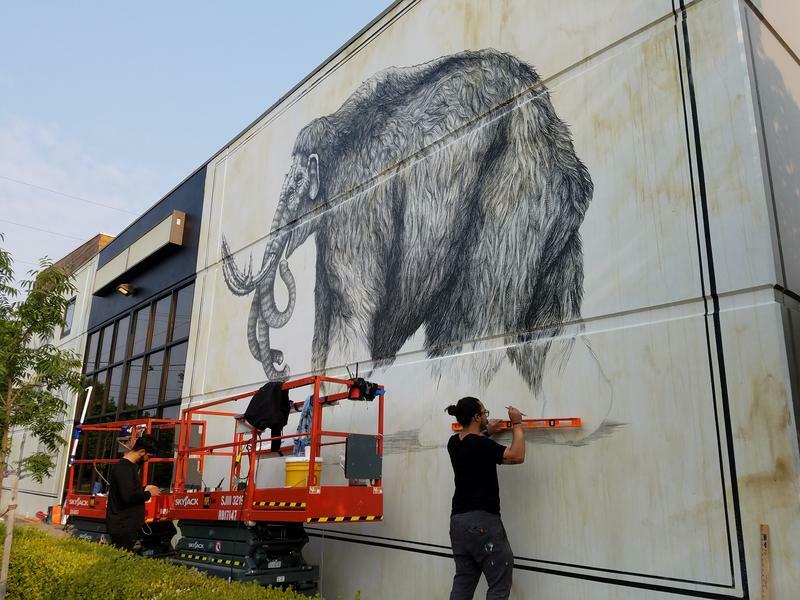 KLCC’s Alec Cowan brings us this audio postcard on the latest addition being painted across from Good Year Tires for Eugene’s 20x21 Mural Project. This transcript has been edited for style and clarity. H11235: "My name is Kiran Maharjan, my artist name is H11235." "So it kind of talks about this whole idea of contradiction -- the contradiction of order and chaos. So 11235, that comes from the Fibonacci sequence, which is very much about this order in nature. And the H comes from this character called Hyde from Robert Louis Stevenson book “The Strange Case of Dr. Jekyll and Mr. Hyde.” So it’s kind of like a simpler shorter version of all of the chaos that Hyde represents and all of the order that the numbers represent." 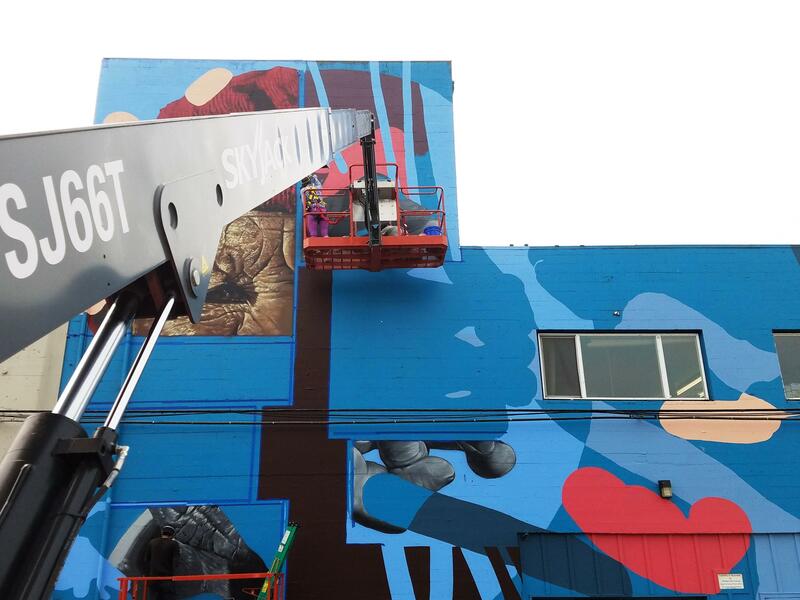 "So the mural is basically a piece… it’s a photorealistic image of half of a portrait of an old man from Nepal, and half of the section has hands that are sort of clasping on each other. So basically it’s very photorealistic in a way, but has a lot of digital aesthetics, with a lot of digital brush strokes, and the whole idea of deconstructivism is also happening at the same time. So it takes into account the whole idea of order and chaos, but at the same time it kind of helps in bringing images together in a very collage-y effect." "I think the eye is very crucial, in a way, because it's very… it's something that I usually paint a lot, as well. I think the eyes are the windows to somebody's soul, right? So it's crucial to kind of get that down. And eyes are also represented very thoroughly in my work, in a lot that I do because I also talk a lot about issues of biological vs. intellectual evolution, and even though we are still biologically in this very backward evolutionary way, we are moving forward in a very intellectual evolutionary way. So eyes kind of represent this biological motif -- but then again it also represents this intellectual growth that we are having, in a way. So usually I do eyes with a stroke of calligraphy on top of it, so that is a symbolic representation of that idea." "Usually I work with digital tools and media, usually Photoshop. I bring images together and see what works and what doesn't work, and I bring it all together so it’s basically… it looks like a random mess at the beginning, so I put everything on it like, sort of, like it's pretty much a mess. So then I start going through the process of cutting it down, what works what doesn’t work. Be very methodological and strategic on what should go on and what shouldn't go on. It's very interesting, the process is very interesting. To put the designing process most of the, 80% of the decisions are done digitally and the remaining 20% depends on how the wall is, working conditions, and it changes from time to time again." "It’s an interesting story, because I was essentially working with drawings and paintings at the beginning; I wasn't really doing a lot of street art. But then again, while I was doing the whole traditional forms of it, I was kind of researching about it because I used to skateboard and that kind of let me do the whole world of graffiti and street art and what it meant. And I was resizing it at the same time, but I necessarily didn’t consider it would be one of the major things I would do even then." H11235 says eyes are a prevalent motif in his work, a propos of the "window to the soul" idiom. "So there's an interesting thing that happened. So I had a collection of drawings that I went to sort of like, this [place] known as ‘galleries,’ these commercial galleries, which were like popping up everywhere in the town. So I went there because I wanted my work to get represented, you know? So I went to each and every one of them and most of them are like, we do not want you to represent your work. This is something that somebody else is doing, or we don’t want something like that anymore. So every one of them declined to represent me, so that was a big turning point for me because denial from them, them not wanting to represent me, and researching having all this knowledge about street art kind of collided with one another, and so, like, if I want my work to be seen I do not need the galleries as middlemen to show my work. I can just kind of get all myself like go out and paint on the street and that is a beautiful way of doing it. So that was a turning point and I have since not looked back from then, I have always been involved the streets and have been doing it since then, and that was like 7-8 years ago." "In a way, essentially, I'm representing Nepal because Kathmandu is the sister city of Eugene, so it's been… I think now it's the 40-year anniversary, so there's a couple of Nepalese families here and they have been really, really gracious to invite me for dinners and kind of listen to how they are doing here, what they do here, you know their families inviting me to their homes and things and essentially feeding me Nepalese food. You know that's been such a warm welcome from them, to have that. And also they are pretty gracious to tell me that even if I ever feel homesick I am always welcome to their house, which is really nice from them, yeah." This audio postcard about Nepalese artist H11235 was produced by KLCC’s Alec Cowan. It’s part of a series on the 20x21 Eugene Mural Project. 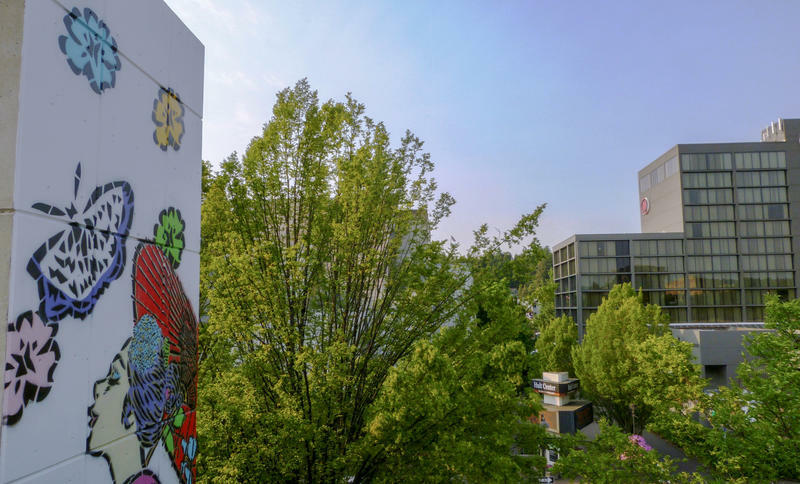 For Eugene 20x21 Mural Project Japanese artist Aiko is bringing stencil work and heritage to the city streets. She’s painting her mural on 6th street’s Parcade across from the Hult Center. 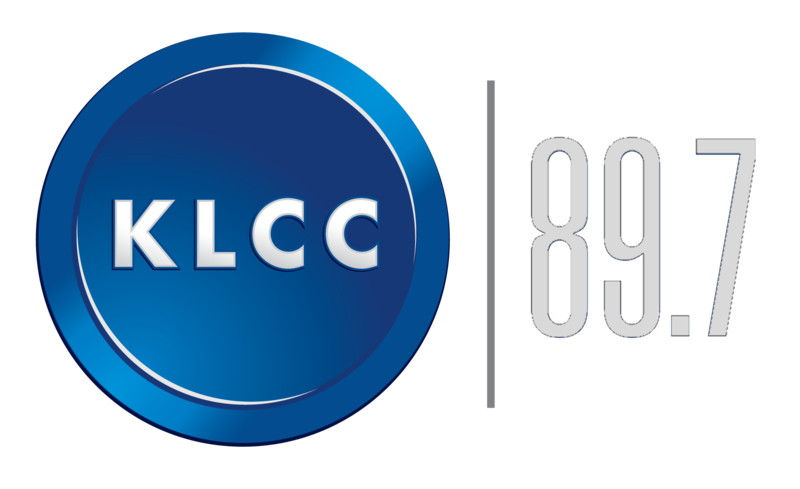 To learn more, KLCC’s Alec Cowan brings us this audio postcard.